Psychoanalysis – which I’ve been trained in – is great for developing insight. It increases what we are now are calling ‘mentalization’, the ability to be aware of internal thought processes. Additional awareness can offer a person additional options, and perhaps better choices. 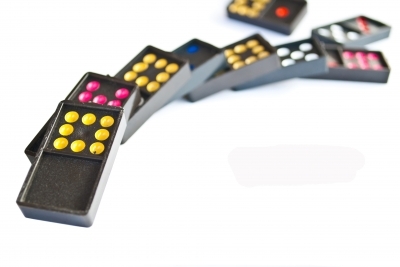 Think of dominos in a row, going click, click, click, as one pushes over the next, etc. Sooner or later you get the idea of reaching ahead of where the action is, and removing a domino, so that when the domino effect gets there, it goes no farther. Or, maybe you rearrange the dominos to send the action off in a different direction. Internal thought and feeling processes are like that. With enough ‘mentalization’, we are aware of what we are going to do BEFORE we do it. That gives us the option to remove one of the steps involved, and not do it. We may be able to rearrange our thinking and do something different. As good as the various therapies (based on the principles of psychoanalysis) are, the amount of relief they provides for flight anxiety is limited. When I started SOAR back in 1982, we were able to get better results than other courses through things borrowed from various therapies, but it wasn’t always enough. Some clients had automatic fear reactions that were too ingrained. For SOAR to work for everybody, we needed a way to alter the psychological domino effect, in which one thought (or image) caused anxiety and led to another thought that caused even more anxiety, etc. we can accomplish the change in just days (it took weeks fifteen years ago). The key element to this therapy is the ‘Strengthening Exercise’. Practice of this exercise makes a neural link between EACH of the things about flying that cause anxiety and the emotional content of a special moment of being with someone who was really tuned into you at that moment. It is that feeling that all ability to calm ones self is built upon. All we need to do is deliberately make connections that would have been made naturally when you were just months old if things had gone better back then.